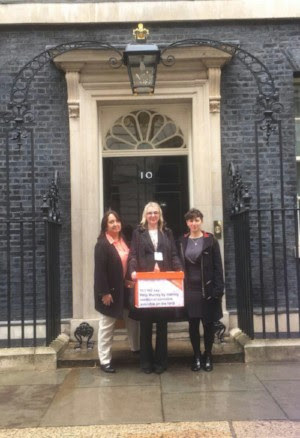 Liberal Democrat MP Christine Jardine today joined her constituent Karen Gray, whose son Murray suffers from a form of epilepsy, to present a petition to the Prime Minister calling for cannabidiol to be made available on the NHS. Murray suffers from a form of epilepsy and this treatment could alleviate his symptoms and improve his quality of life. Ms Jardine is now seeking to secure a debate in the House of Commons to highlight Murray’s case. The NHS currently does not facilitate its medicinal use, despite the UK Medicines and Healthcare Prodcuts Regulatory Agency having declared that products containing cannabidiol are safe. Christine Jardine MP, who represents Edinburgh West, has supported Murray throughout the campaign. The petition handed to the Prime Minister today, launched by Karen Gray on 38degrees, has attracted support from over 170,000 people. “I’m delighted for Karen and Murray that they have reached this target with such fantastic support from the public. But we must remember that there is more to be done and the important thing will be getting through to this Government how important it is to change the law. “Children like Murray are suffering and it is within our grasp to change that. We mustn’t lose sight of how important this is. “My son has spent years of his young life in hospital. There is an effective treatment that could give him his childhood back. To know it’s out there, but is being blocked by the government is heartbreaking. It’s simply common sense – if a treatment works we should let our NHS provide it. Karen Gray’s petition, with 170,823 signatures at the time of this release, can be found here.